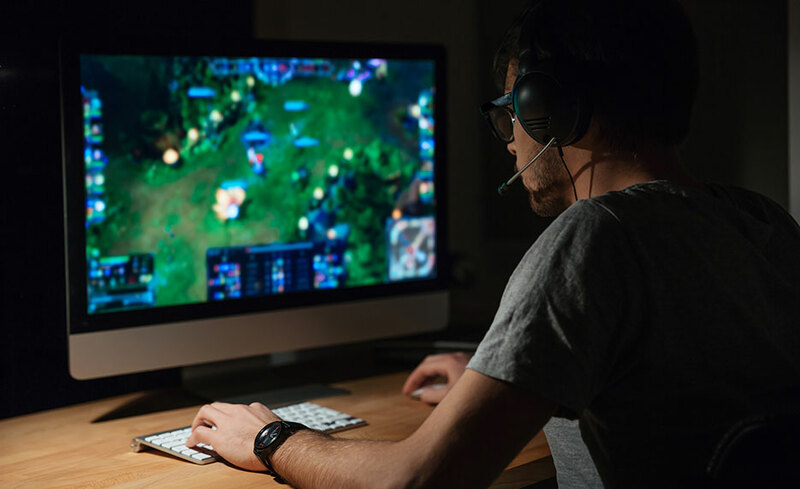 The Video Game Design and Development Online Training Program is the place to start if you’re seeking a professional career as a video game designer and developer. This program is also well-suited for enthusiastic amateurs and gamers looking to explore this exciting field as a recreational endeavor. Video game design and development is challenging, but the rewards are worth it. With this unparalleled comprehensive training program, you’ll master skills that open doors to the growing video game industry. By the end of the program, you will have designed and created your own video game for the PC and will stand ready to join a team working on projects with larger scope or pursue independent development. Using a comprehensive and analytical approach to game development, this program offers you the opportunity to learn how to effectively implement technical game ideas, assuming no prior training or experience. The curriculum is divided into four major areas of study: programming languages, mathematics skills, game asset creation, and modern real-time game engines. It will conclude with an independent study phase where you will design, document, and create your own game using all of the programming and game art skills you learned in the core classes. To enroll in this program, you need to have a reasonable familiarity with computers and a background in high school-level mathematics is strongly recommended. No prior game or graphics programming experience are necessary. The Video Game Design and Development program is for you if you seek a professional career as a game developer. It’s also well-suited for enthusiastic amateurs and gamers looking to explore this exciting field as a recreational endeavor. Frank Luna has been programming interactive 3D computer graphics for over a decade, and he's been using DirectX since its fifth iteration. He has nearly fifteen years of C++ programming experience and has also programmed professionally in Java, C#, and MATLAB. He has worked as a contractor, with Hero Interactive, and on the open source Scorch 3D engine. Over the years, Frank published a number of best-selling textbooks on game and graphics programming, with his most recent being Introduction to 3D Game Programming with DirectX 11.0. He has been teaching both C++ and mathematics for games since 2004 at the Game Institute. John DeGoes began writing software and designing digital logic circuits during the early 1980s. He has been actively involved in the fields of computer science, mathematics, and game development for more than fifteen years. John graduated at the top of his class in undergraduate studies in applied mathematics at Montana State University-Billings. He has authored two successful games programming books, 3D Game Programming with C++ and 3D Game Programming with C++ Gold Edition, and he's co-authored a third book. John has also written and published articles for popular programming magazines and technical journals. He developed software for commercial programs such as "qED," "Pro Bass Fishing," "Mansion of Mystery," along with other assorted titles. Currently, John is on the road to acquiring his doctorate in applied mathematics, and he intends to research computational and mathematical methods for the study of complex dynamical systems. Gary Simmons started games programming in 1981. He was always fascinated more by how games worked than actually playing them (although he will admit to playing too). In 1985 Gary became the host of "Video and Chips," a United Kingdom television program dedicated to exploring future computer technology. Over the years, Gary has dedicated most of his time to researching and developing cutting-edge game techniques. In May 2000, Gary founded Mr.GameMaker.com, a teaching site dedicated to helping game programmers (hobbyists and professionals alike) learn cutting-edge game programming techniques. Over the years, Gary has published dozens of full-length game development papers and tutorials. He has been teaching programs since 2001 and also serves as a faculty director. Adam Hoult got his start programming in the early 1980s on the ZX-80/81. After developing several demos for the Commodore 64, Adam got a job writing software for a local company, specializing in accounting and production software. He went on to develop 3D multimedia presentations demonstrating client production systems. This experience rekindled his earlier passion for games programming. Over the years, Adam has worked on many projects, but he's focused his efforts mainly on engine and tool design for games. He spent time running a successful tools production company as well as his own game programming Web site. Adam later teamed up with fellow faculty member Gary Simmons and developed the successful Mr.GameMaker.com teaching Web site. The site gathered a loyal following as it provided information and tutorials for beginners and professionals alike on subjects that were often considered difficult to find on the Internet or in books. Adam is currently the lead technology developer at the Game Institute. He's working on some exciting upcoming 3D game projects in addition to teaching programs. Brian Hall is currently an engine and AI programmer at Midway Amusement Games, where he's working on advanced AI algorithms for an upcoming action-adventure console title. He has also designed and written parametetric airport generation software for SimAuthor Inc, as well as a real-time CLOD terrain system using real-world satellite imagery and elevation data. Previously Brian was a senior engineer at Accurate Automation Corporation, where he developed real-time learning systems for detecting pilot-induced oscillations in aircraft and intelligent path-finding for cruise-missile type applications. David Bourg is a naval architect and marine engineer, David Bourg performs computer simulations and develops analysis tools that measure things such as hovercraft performance and the effect of waves on the motion of ships and boats. He teaches at the college level in the areas of ship design, construction, and analysis. On occasion, David also lectures at high schools on topics such as naval architecture and software development. In addition to his practical engineering background, David is professionally involved in computer game development and consulting through his company, Crescent Vision Interactive. Current projects include a massive multiplayer online role-playing game, several Java-based multiplayer games, and a couple of PC-to-Macintosh game ports. David is currently finishing his Ph.D. in engineering and applied sciences. All of our programs are self-paced and open enrollment, so you can start them when you want and finish them at your own pace. Upon registering, you are given twelve (12) months to complete this program. Each student is given access to a support team of game development experts and teachers. You can interact with instructors using the discussion boards found within the courses and can send private site messages and emails as well. In order to take our online programs, you must have access to a computer and the Internet. You can access the program contents from any Web-enabled computer. You don't have to use the same computer to log-in to the program every time. As a general rule, we suggest allocating an average of 10 - 20 hours per week. However, this will vary from individual to individual. If you’re just getting started and have little to no experience, certainly try to put in as much time as you can and try to maintain a consistent schedule. Ultimately each student will find a pace that is comfortable for them. 14. What platforms will we study? Most modules in this program are designed for PC development on the Windows platform. However, the techniques that you learn in our program can often be non-platform specific. In cases that are platform-specific, source code can often be ported to other computer development platforms (such as Macintosh and Linux) with varying degrees of effort. Consoles, such as Xbox One and PS4 utilize closed-development libraries, and they’re not compatible with this program. However, most of the general game-engine development techniques you’ll learn are certainly compatible with all major consoles, regardless of the differences between APIs. 15. Where can I get the latest version of the software? Is it free? All of the software used in this program is free. You can download the latest versions online using the links provided with the courses. The best part of this program was the audio in the lessons. Normally, I learn best by assisted reading. Since I did not have an instructor the audio threw in a lot of what was not found (personal experience) elsewhere. The thing that most kept me going on the first graphics module was the accent of the Geico Gecko -- he really kept me interested! He also demonstrated direct knowledge and testing of the material he talked about --- awesome.